Editor’s note: Genzebe Dibaba missed the women’s world record by 2 seconds Sunday at the Carlsbad 5000, but at least three age or age-group world records were set. See details here on the 30th running. Times of San Diego will cover Sunday’s Carlsbad 5000 road races with the new Meerkat live-streaming app. A world record is possible. Portions of the 30th annual event — including start and finish of the masters and elite races — will be viewable via Twitter. Just follow Times of San Diego and click “View on Web,” which opens a window on any device. Meerkat is less than a month old, but the app gained buzz at the South by Southwest tech festival in Austin, Texas, where it was introduced March 10. Times of San Diego pioneered the app locally with coverage of the local Society of Professional Journalists’ Windows and Walls Awards. Recognized as the “World’s Fastest 5K” with a history of 16 world records, the Carlsbad 5000 celebrates 30 years running Sunday. 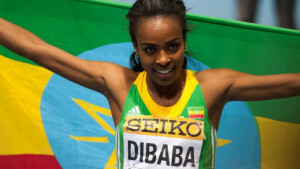 Organizers say the athlete with the best chance for a world record this year is 24-year-old Ethiopian Genzebe Dibaba. The younger sister of three-time Olympic gold medalist Tirunesh Dibaba, Olympic silver medalist Ejagaychi Dibaba and the cousin of Olympic champion Derartu Tulu will aim for her fifth world record in her debut on the roads. The listed world record of 14:46 was set by another Ethiopian, Meseret Defar, at Carlsbad in 2006. “I know the world record is tough, but I want to come and break it,” Dibaba said. Dibaba began her assault on the record books on Feb. 1, 2014, at Karlsruhe, Germany, winning an indoor 1500 meters in 3:55.17, chopping more than 3 seconds off the previous mark. Five days later, at Stockholm, Sweden, Genzebe improved the world indoor record in the 3000 to 8:16.60, 30 seconds better than her personal best and more than 7 seconds quicker than the world mark. Then, on Feb. 15, at Birmingham, England, she set the world indoor two-mile record of 9:00:48, 6 seconds faster than the old mark. That made her only one of three athletes to set three world records in three different events in 15 days, joining Olympic legends Jesse Owens and Usain Bolt in that feat. And she is the only one to perform that feat in three different cities and meets and all in individual events, event organizers say. On Feb. 19 at Stockholm, Dibaba gained her fourth world record, winning an indoor 5000 in 14:18.86. Among her challengers are Deena Kastor, 42, of Mammoth Lakes, who set the American 5000 road record of 14:54 in 2002 at Carlsbad and will be aiming to break that mark again. She also will be chasing the world masters record of 15:48 established by Colleen De Reuck in 2004. Kastor also won at Carlsbad in 2000. Another top contender should be Brenda Martinez, 27, of Rancho Cucamonga, Calif., the bronze medalist at 800 meters at the 2013 World Championships whose best 5K is 13:44 while finishing fifth at last year’s Carlsbad race. Also, there’s Sentayehu Ejigu, a 30-year-old Ethiopian, the world indoor 3,000-meter bronze medalist who finished fourth over 5,000 meters at consecutive world championships and was third at Carlsbad in 2006.